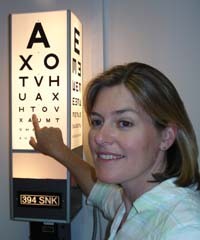 The initial consultation will include a test of visual acuity (eyesight) and an examination of the eye. It may be necessary for you to have drops instilled to widen the pupil. This is particularly likely if you have symptoms such as decreased vision, visual distortion or flashes and floaters in your vision. The drops take about 30 minutes to work, which will prolong your appointment time, and may make you more sensitive to light and interfere with your ability to drive safely. This effect normally lasts several hours. You should bring sunglasses with you and, if you are not using public transport, arrange for someone to take you home after the consultation. Some problems, such as eyelid cysts, may require minor surgery under local anaesthetic, which can often be performed immediately after your consultation. If you are a private patient, it might be worth checking with your health insurance company that they will cover this when you contact them to authorise the consultation.